When selecting a coupling, identifying and using the correct service factor is one of the three basic inputs (with the other two being horsepower and rpm). Given just these three pieces of information an initial coupling selection can quickly be made. Unfortunately, not all service factors are created equal. While many manufacturers use AGMA 922-A96: Load Classification & Service Factors for Flexible Couplings as a baseline, this is NOT a standard basis for rating document across all manufacturers. As such, it is critical to check and use the manufacturer's recommended service factor first and foremost. Manufacturer's service factors may be specific to both application and the coupling type. Variability may exist because different couplings are more or less well suited for a given application, but they also may exist because of marketing gamesmanship. Without a standard basis for rating, some manufacturers have or may take liberty to present their product in what they believe to be the most favorable light. Efforts may include improving certain ratings (i.e. - increase published max torque) and compensating for it in other ways (i.e. - increasing service factors). As such, again, it is important to pull service factors from the manufacturer, make sure you are considering both the driven and driving equipment, and not assume a "one size fits" all approach. To determine an application service factor for a Lovejoy branded coupling, please download the product catalog and find the correct application service factor chart for the given coupling type. Should you have any further questions regarding an application, please do not hesitate to contact a Lovejoy application engineer or your favorite Lovejoy authorized distributor. 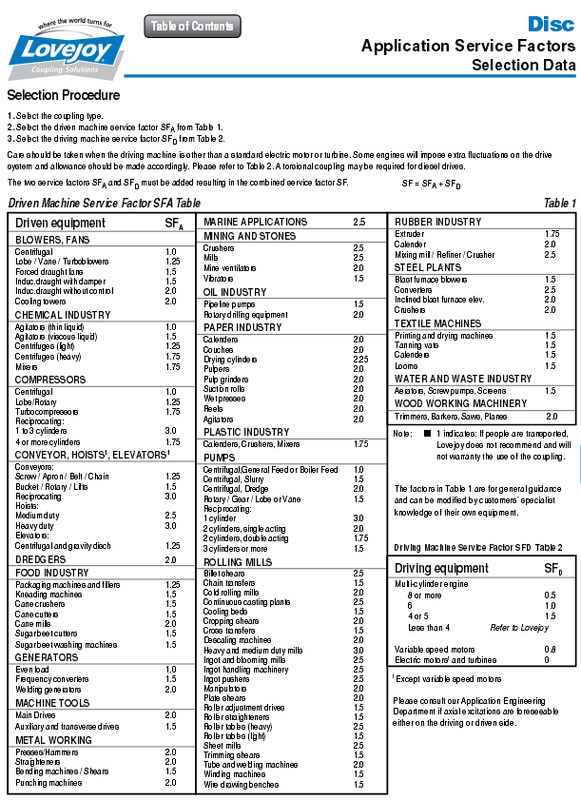 A PDF catalog screen capture of what a manufacturer's application service factor chart may look like for a given product range in their catalog has been provided below.